SHORTLISTED FOR THE FT & MCKINSEY BUSINESS BOOK OF THE YEAR AWARD 2018A Financial Times Book of the Year and an Amazon Top 100 Book of the YearIndia's explosive rise has driven inequality to new extremes, with millions trapped in slums as billionaires spend lavishly and dodge taxes. Controversial prime minister Narendra Modi promised `to break the grip' of the Bollygarchs, but many tycoons continue to thrive amidst the scandals, exerting huge influence over business and politics. But who are these titans of politics and industry shaping India through this period of breakneck change? 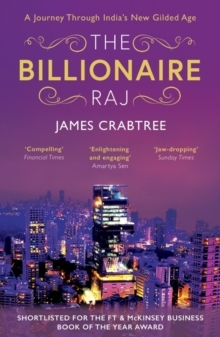 And what kind of superpower are they creating?A vivid portrait of a deeply divided nation, The Billionaire Raj makes clear that India's destiny - prosperous democratic giant or corrupt authoritarian regime - is something that should concern us all.